Lost and have no idea where to start? Wondering how to get your first dinosaur and what all the shiny buttons do? Then you’re in the right place! Below are all the basics you need to get playing Exhibited and building your own dinosaur farm. Before you get your first dinosaur it needs an enclosure to live in. To get an enclosure, click on ‘Farm’ near the top of the page and click the ‘Buy Enclosure’ button, which will cost $20,000. I know, quite the chunk from your starting money right? Don’t worry, you can easily make this back! You can read more about that further in to the guide. To get room for more dinosaurs you can click the ‘Expand’ button down among your enclosure settings which charges $2500 for each additional space. One of the features you may want to take extra notice of is the ‘Foilage State’ which determines how happy your dinosaurs are in the enclosure depending on their species. Right now it is just for show and does not affect your dinosaurs but it will in the near future! Heading to The Lab and taking your first dinosaur home! Now that you have everything set up, it’s time to get your first dinosaur! Click on ‘Map’ and go to the big glass building on the top map. When you hover over it, it will say “The Laboratory.” Here you will find four (4) dinosaur species to choose from which is generated at random every two (2) hours, so you can always check back later for different species. It costs $5000 to create the dinosaur plus additional costs should you select to have their contract ‘unlimited’ or to have the dinosaur as an adult; which means you can instantly start breeding and battling it! If you do not take the unlimited contract option your dinosaur will be limited to four (4) offspring and you cannot change this, so choose carefully! A beginner can create ten lab dinosaurs to get started. From there on, you can create five (5) lab dinosaurs a month from the beginning of each month. Once you have filled out the form, click ‘Create Dino’ and your new dinosaur will be made, its colors and marking type will be random. Time to head on back to your ‘Farm’ page to put your dinosaur in it’s enclosure. Near the top-right of the page you will see ‘Moving Crate’ with your dinosaur in it and a list of enclosures it can go in to. You will see the enclosure you just bought; select it and click “Move!” and it will be put in to the enclosure. Bear in mind that you can’t have mixed species in an enclosure so don’t buy dinosaurs different from the species you just put in the enclosure unless you have another to put them in. Otherwise, it will be stuck in your moving crate and you can’t buy any new dinosaurs until you take it out of there. That wouldn’t be good! Another way to get dinosaurs is buying them from another player. To have a browse at what is currently for sale, head to the ‘Map’ page and on the top map you will see a little magnifying glass. Click on this and it will take you to the search page. You will see quite a lot of options, but don’t worry, you don’t need them all! This is only if you want to be very specific. For now, we just want to see what is out there. Under ‘Dinosaur Search’ you will see ‘For Sale/Bid’, select ‘Sale’ and under it enter the maximum price you are willing to pay. The higher you put, the more dinosaurs you will see. If you would like to see all that are for sale under the price you have entered, leave species set as ‘Any’. Otherwise select the species you would like to view. When you are done, click ‘Search!’ at the bottom of all the options and a list of available dinosaurs will show. If you want to see ones that are for ‘Bid’ instead of ‘For Sale’, repeat the above steps but select ‘Bid’ instead. A dinosaur that is for bid means you will have to wait and see if the owner will accept the amount you bid on it, with ‘For Sale’ you can buy the dinosaur instantly! If you find a dinosaur that you like, click on the ‘Currents’ tab on the dinosaurs page to buy it and also to see the specific price. Any dinosaurs you buy (either from being for sale or for bid) will go in to your moving crate just like a lab dinosaur would or if another player transferred a dinosaur to you. All you have to do is select the enclosure for it to go in again as explained previously via your ‘Farm’ page. Still wondering about something not answered in the Game Guide? Then you can speak to one of our Exhibited Gurus! The Gurus are a team of people who know just about everything Exhibited related and dedicated to all players new and existing. You may have already heard from a Guru when you signed up and received a ‘Welcome!’ message in your inbox. You can reply to this message for that particular Guru to answer your question or you can submit a help report so all available Gurus will see. To the right of your screen on any page you will see your ‘User Tools’ box and a ‘I Need help!’ button. Click this and a window will pop up across your screen. In here you can type subject of your question in the top section and then your question below. This will send a help report and one of the Gurus will get back to you ASAP! You can also use this link should you need to send a message to a Mod for anything more serious. However all game related questions should go to a Guru and if you are unsure if your situation may require a Mod, send it on to a Guru and they will pass it straight over to the Mods if they are needed. That’s pretty helpful, isn’t it? Please keep in mind that this feature is not for submitting bug reports as it will just delay other users needing help. If you think you have spotted a bug, head on over to the ‘Boards’ then go to the ‘Bugs’ section and post a topic there about it. This makes it easier for the Mods and/or the owner to see so they can fix the problem for you! Items, Shops, and Your Inventory! There are different types of item in the game; food, healing, equip-able, collectable and various others. Any items you obtain are stored in your ‘Inventory’ which can be accessed via the ‘Inventory’ button at the top of the page. In your inventory you will find links to view by item type for better finding. To use an item, click ‘use’ and you will see options related to whatever type of item you picked. If it is an item for your dinosaur you will see all your dinosaurs in the list for you to choose the one you wish to use the item on. For the likes of ‘Collectables’ there will be a ‘Put on Shelf’ option which is simply to show off your collectables you’ve managed to get to other players. Your shelf can be viewed by you and other players by going to your profile. You may notice for some items in your inventory, it will say ‘Stacked’ instead of ‘Uses’. This means you have more than one of this item and you will need to click ‘Use’ to select a specific one to use from your inventory. If you would like to combine the stack in to one item, click on the ‘Use The Item Compressor?’ link to take you to the item compressor. From here you can select the item and then compress it. Keep in mind that once you compress an item it cannot be undone, so use wisely! NPCs (Non-Player Characters) run different kinds of shops that you can find by going to your ‘Map’ page. Hovering over the buildings will show you what the shop is and hint towards what kind of items it has. When you select one of the shops you will see the items that are currently in stock, how many are in stock and the price of that item. Not all items will always be in stock so be sure to check back later if there is a specific item you’re looking for or if you want to see if there is anything different. Can’t find an item in the NPC shop or want a bargain? Another player might have what you are looking for! Head on over to the ‘Map’ page and click on the little caves behind ‘The Store’ and you will be taken to a search page to see if any other player has the item you are looking for in stock. As you are typing, suggestions will pop up containing the word(s) you are typing, handy if you are unsure about the spelling and/or for reassurance! You and every other player have their own shop when they begin the game where you can sell items. To stock up your shop head to your inventory and click the ‘use’ button on the item of your choice, here you will find a ‘Put in Shop’ option in the drop-down menu. You will be taken to your shop page when you do this, however you can easily access your shop at any time by clicking the ‘Shop’ button which is right by your ‘Inventory’ button. You may price your item at anything you want. If you are unsure what to sell it for, have a look at some other player shops to see what they are selling it for and that may give you an idea. Any item in your shop can be removed by clicking the ‘Remove’ button under the item and it will go straight back in to your Inventory. Your shop comes with thirty (30) spaces by default but can be expanded by clicking the ‘Upside?’ button to give you more space if you need it. Each slot is $5,000 so be sure you have enough money in-hand so you can expand your shop. Another place you can look for items and bargains is the Bartering section. To get here, click ‘Map and on the 2nd map you will see little coloured tents titled ‘Marketplace’ when you hover. Select ‘Bartering’ to get to the Bartering section. Here you can browse to see what other players have to offer and what they want for it if they have specified it. If they haven’t specified, make your best offer! You can offer money, scales and up to three (3) items. You can review your offer(s) by clicking the ‘My Offers’ button. You can set up your own trade by clicking the ‘Create New’ button. Here you can give your trade a name, select up to three (3) items to offer, money, scales and you can say what you are looking for in exchange for what you have in your trade. Once your trade is set up, it will appear in the ‘Most Recent’ section for all to see when they enter and you can also view your trades via the ‘My Trades’ link. Don’t worry about having to constantly check to see if anyone has offered, go ahead and continue playing and you will be alerted whenever someone has made an offer in the form of an automated message. On Exhibited you can breed your dinosaurs for whatever you want. It can be for colors, markings, stats, perfects, or genetics – anything you like! However what you breed for can affect how well the dinosaurs sell. Usually dinosaurs with higher stats and "perfect" genetics will sell better than dinosaurs with average stats or negative genetics. A “perfect gene” dinosaur is a dinosaur with all the positive genetics affecting them and doesn’t carry any negative genetics. Don’t let that hold you back from breeding whatever you like though, these are only tips if you want to make money from selling dinosaurs. Your dinosaur needs to be 10 days or older to breed for the first time, your dinosaur's last day to breed is 80 days old. If you want to breed your own dinosaurs together you first make sure there’s enough room in your enclosure. Once you’re ready, go to your dinosaur’s page and go to the Owner tab. Select what dinosaur to breed to through the drop down list and click the ‘Breed’ button. Please note you can only breed dinosaurs of the same species together. You will then be able to select one egg (or two eggs if you’re upgraded) from the clutch to keep. Once you’re done selecting click the “I’m Done Now” button at the bottom of the clutch. Make sure to visit your incubator to make sure your temperature(s) are set correctly to what gender you want and to turn eggs once a day. Turning eggs gives your baby dinosaur a small, random stat boost. If you want to find a stud for your dinosaur, other than the ones you own, you can go stud searching. To find studs on the Search, go to the Search page and make sure to select a stud option along with what species of stud you’re looking for. ‘Public’ means you just pay the fee and it’s automatically bred with the dinosaur you have selected, ‘Private’ means you have to have the breeding you’re trying to buy accepted by the stud’s owner. Once you find a suitable stud, go to the stud’s page and then select Current tab. The price of the stud will be on the ‘Breed’ button. Click that, and if it’s public you’ll be able to pick eggs right away. If it’s private you’ll have to wait until the breeding request is either accepted or rejected. Just like with Inside Farm breeding make sure you check your incubator and visit your growing chicks every day until they hatch. Trials are a very important part to the game - this is how you obtain your regular points for your dinosaurs! There are four different types of Trial: Agility, Conformation, Hunting and Racing. There are no formal qualifications needed to participate so go right ahead and try them out! The Agility trails are centered around the intelligence stat point - if you have smart dinosaurs, agility trials are just for them! The contestants use their quick brains to help themselves weave through difficult and mind teasing courses to bring home some points. Conformation is a trial that brings in judges to see how well your dinosaur conforms to their set standard. Conformation trial competitors need solid stat points in all three areas: intelligence, strength, and speed. The higher they all are, the more the judges will like your dinosaur. Hunting is the trial that focuses on the strength stat of your dinosaur. In the Hunting trails your dinosaurs will be sent out into the woods to hunt game and the first one to take down and bring it back wins. Speed plays a vital role in the Racing trials and the higher the speed stat is on your dinosaur the more likely it will win. Your dinosaurs will be lined up in a specially fenced in track and let loose to follow a leg of lamb being drug across the floor at top speed. The first one to catch up wins! In order to enter a trial you first click the Trials building on the Map page, it’s the coliseum-like building near the mountains. From there, you will be shown a form that says "Find a Trial." Use the drop down lists to select what kind of trial you want to enter and what rank. You must have a dinosaur in that rank to participate. If you have any specifics you want to list either type them in or you can leave them blank in order to return all the trials that you can enter in the specific type you’ve selected. Click "Search" and the trials you specified will be shown to you. There just click a trial and select the dinosaur you wish to enter into this trial, and then hit ‘Enter’. Trials run every day and if you are an upgraded member you can create trials fellow members can enter and to earn a little money for yourself. Training is an excellent way for your dinosaur to succeed. Access the training page by going to the Map page and clicking on one of the two dirt circles near the Trials building. 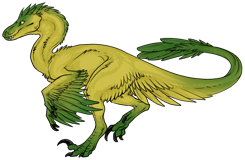 A form will be on the page for you to fill in which allows you to choose which dinosaur you will be training and what stat you wish to train them on. It costs $500 each time you train a dinosaur and it is always successful, and you can do it once a day for each dinosaur.